After surviving an unforeseeable in-house dispute between certain ex-employees of Infinity Ward and the powers that be at Activision, Call of Duty: Modern Warfare 3 suffered a relatively turbulent beginning. The loss of a number of high profile, key members of staff was an unfortunate predicament; though the initial uproar and debate as to whether this signalled the demise of the Modern Warfare franchise was perhaps somewhat over-exaggerated. Clearly, the preparation was far from ideal, especially considering the fact that the Call of Duty franchise had stiff competition in the form of Battlefield 3 (see our review); a notable factor which has been absent during its five-year tenure of undisputed, console dominance. However, backed by the publishing power of Activision, a welcomed show of support from an in-house developer known as Sledgehammer Games and a tried and tested formula; Infinity Ward regrouped like a typical war-hardened unit, valiantly soldiering on. The question is, did this unlikely set of circumstances hinder the final product? In short, no. Modern Warfare 3 is another action fuelled blockbuster, one that will no doubt produce another chart smashing trend of record sales (a staggering 9.8 million copies sold as of writing this review). Is it the same experience we’ve been enjoying since 2007? Predictably, yes; though whether or not this is a negative or a positive depends entirely on your prerogative. The story picks up immediately after the events of Modern Warfare 2. Soap (though considerably worse for wear) is reunited with his brother in arms, the brilliant and strangely charismatic, Captain Price. Price’s nemesis Vladimir Makarov has resurfaced, and is consequently causing all sorts of unruly hell. Determined to see the world burn, Makarov has waged an all-out war on Europe and America. The onus falls upon Soap, Captain Price and the armies of the invaded nations to put an end to Makarov’s reign of terror once and for all. New York had seen better days. What precedes the penultimate conclusion of the trilogy – though I strongly doubt that this will be the last iteration in the Modern Warfare series (milk, milk) – is around six hours of explosions, gloriously scripted set pieces, failed rescue attempts, shooting, reloading – rinse and repeat. 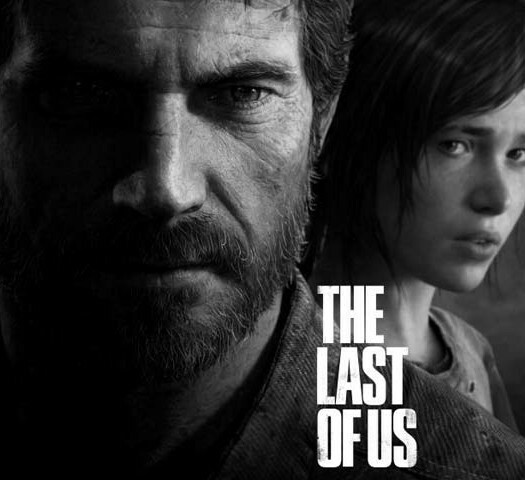 The story is compelling enough, effectively building upon the previous games’ narrative. A couple of awe-inspiring moments are scattered along the way, such as falling through a multi-storey car park in a tank (yeah, you read that correctly). Its 100mph, balls to the wall action from start to finish. If Michael Bay could produce a video game, then this would undoubtedly be it. I for one, found myself completely unmoved by Infinity Ward’s attempt to establish an emotional connection. 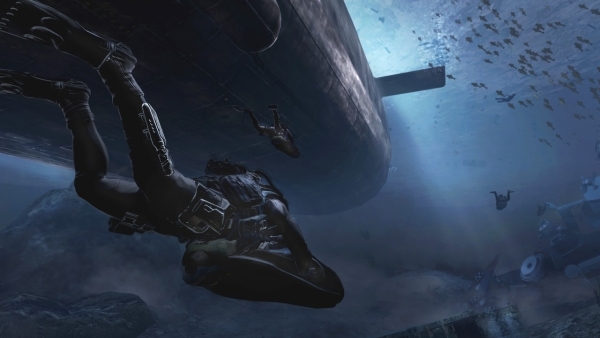 Surprisingly, Infinity Ward opted to avoid building upon Modern Warfare’s controversial reputation with a notable absence of such an infamous mission as ‘No Russian’. Instead, Infinity Ward has focused on bringing the war to recognisable, global locations such as London, New York and Paris, which was presumably aimed at providing a greater, more personal reaction to the horror of Makarov’s actions. I for one, found myself completely unmoved by Infinity Ward’sattempt to establish an emotional connection. The complete lack of conviction in their representation of London was in all honesty, slightly embarrassing. Now I’m sure there’s a colossal list of legal reasons as to why the subway map located in the underground was populated with a multitude of whimsical locations (Queen Gorilla Street and Panda Bear Road being particular highlights), which leads to the obvious question, why include it at all? Then, as I exited the underground I was greeted to no less than six red double decker buses, a number of red post boxes and a clear view of Big Ben on the horizon. Wow, this is has to be London! It was as pathetic as it was hilarious. I was surprised I didn’t bump into the Queen and a couple of Beefeaters. 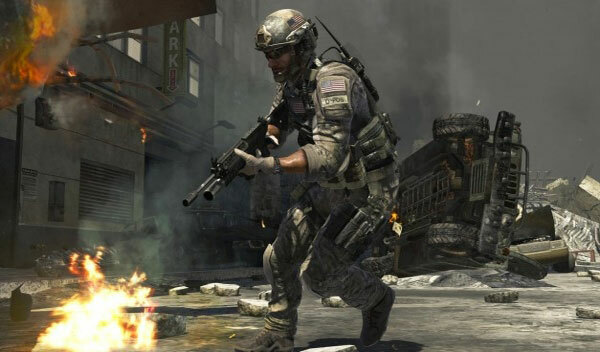 Modern Warfare 3’s biggest strength, and biggest weakness, is familiarity. Trust me when I say that Modern Warfare 3 is an unashamedly, near identical experience as to what you have already played. I’d go as far to say it’s no different fundamentally to Call of Duty 4: Modern Warfare, a game that was released back in 2007 no less. Where to begin? Ok, so first of all you have all the tell-tale signs of the COD experience; the death quotes, the grenade indicators, the exact same HUD display, the way point indicators, the slow-motion door breaches, the illuminated objectives, the simple menu layout, the collectable pieces of Intel, the situation based items (such as the ability to call PREDATOR missiles), the shoot, cover, reload mechanic, the same damage screen, the abseiling sections and the, “wait for them to pass…ok take them out” scripted stealth missions. Add the linearity, an ageing graphics engine and a few new forgettable weapons and you’ve got what could only be classed as a re-branded expansion pack. 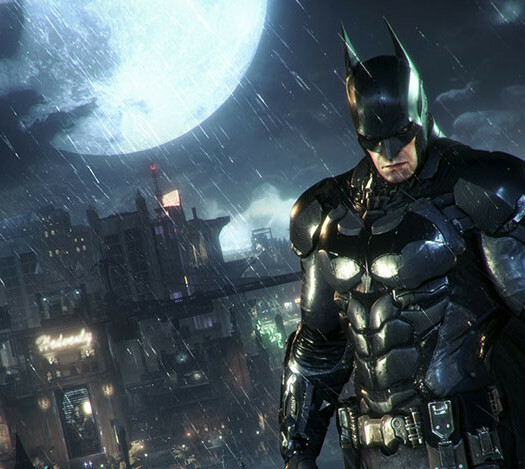 Everything works as it should, and the 60 frame per second performance does provide the trademark, fluid, twitch gameplay experience which is still a strong point, but that’s just not enough any more. This may look exciting and fresh, but unsurprisingly it isn’t. I would love to highlight the innovation, the new features and the expansion of ideas, however, you will not find anything remotely of the sort here. Apart from a few new multiplayer modes and different spec-ops missions, you honestly won’t encounter anything that you haven’t already experienced countless times before. And in my opinion, that’s bordering on the verge of a disgrace. Let’s not forget, that the Call of Duty franchise is a global phenomenal. It is one of the most recognisable brands in gaming, supported by one of the biggest publishers in the industry, and yet, year after year, under a new title, a Call of Duty game is recycled; spat out to fans with a ludicrous price tag, including the wave of overpriced DLC released later down the line. And yet, millions upon millions of gamers lap it up. Why? One can only presume that it’s the multiplayer component which is obviously in attendance and, yes, it’s still as fantastic as it ever was, often feeling like the only area that has any focus (the new addition of the Call of Duty Elite statistics system is as genius as it is obvious). But does this really excuse the complete lack of ambition or the sheer cowardice as to not take any sort of risk on the behalf of the developer? Does it justify the same recycled content (see video below), cheekily disguised as brand new? I’m as perplexed as I am amazed that Call of Duty continues to thrive, simply by producing the same game, again and again, and again. Foolishly, my anticipation for Modern Warfare 3 was high. I was excited to see the changes that Infinity Ward would produce under pressure, especially considering the fact Battlefield 3 was ready to offer a worthwhile, competitive alternative. But instead, as is custom with this enigma of a franchise, they played it safe. In fact, the term ‘safe’, is probably an understatement. For what gamers have been eagerly waiting for, is exactly what we’ve had. Surely then, it can be no better or worse? Well, that decision is down to the individual, but there is a reason why we don’t play the same 2-D platformers anymore, it’s because some developers, those who are at the top of their game, decide to better themselves, they strive to innovate and entertain their fans. They refuse to rest on their laurels because as history as proven, time and time again, this will only take you so far. The sad fact is, I’m pretty confident I’ll be experiencing this same ride all over again come next November. Prefer moving pictures and sound? Then watch our video review here. Call of Duty: Modern Warfare 3 was reviewed on Xbox 360. Some say that familiarity breeds contempt. Others believe that ‘if it ain’t broke, don’t fix it’. Depending on which camp you reside in will ultimately be the deciding factor as to whether you perceive Modern Warfare 3 to be a triumph or an eerily unpleasant case of blatant recycling. Call of Duty claimed the FPS crowd thanks to an innovative, exciting multiplayer component and fluid exciting action. Five years of this formula, this EXACT same formula has bored me to tears. I genuinely feel as though I am banging my head against a brick wall, desperate for Infinity Ward and gamers to wake up and demand something more than a rehash. Yet alas, I fear this day will never come.